Qualification : Good academic record as defined by the concerned university with at least with at least 55% marks or an equivalent grade in a point scale where grading system is followed at the Master’s Degree level in the relevant subject from an Indian University, or an equivalent degree from an accredited foreign University with NET/SLET/SET conducted by the UGC, CSIR/AIU. Application Fee : Candidates belonging to General Category have to pay Rs. 805/- & Rs. 405/- for reserved categories through Challan in the J&K Bank branch. 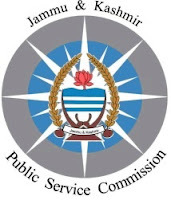 How to Apply : Interested Candidates may apply Online through the website http://www.jkpsc.nic.in from 28.10.2017 to 28.11.2017 thereafter website link will be disabled.